The greatness of the Bhagavad Gita is that it is perhaps the most comprehensive and complete book of knowledge and philosophy that mankind has known in any language, any culture. Is has been translated, therefore into every language of the world. 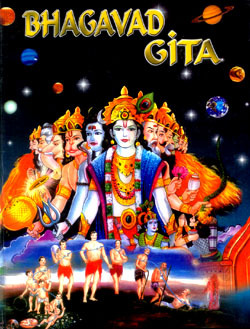 The Bhagavad Gita is included in the longest epic, The Mahabharata, which consists of 100,000 slokas. This magnum opus centres around the Great War, representing forces of good and evil. It is said that the Mahabharata is a historical fact and it reflects the state of affairs from the 10th century B.C. to 4th century A.D. The Mahabharata originally consist of 8,800 verses dealing with victory. Later, the number of slokas was increased to 24,000 and it came to be known as the "Bharata" - the first Aryan tribe to settle in the India after whom the country came to be known. The final compilation brought the number of verses to 100,000, which came to be known as "The Mahabharata." Bhagavad Gita is a part of it, like a little shrine in a vast temple. Arjuna is the soul of man and Krishna, the charioteer of the soul. The battle itself is a symbol of hope meaning whoever has goodwill is never lost and that in the battle for eternal life there can never be defeat, unless we run away from the battlefield. It is karma that is interwoven in the "Bhagavad Gita" with the ideal of love. Bhagavad Gita contains the advice that Sri Krishna gave to sad, demoralized Arjuna on the first day of the battle. The Bhagavad Gita is the nursery of all Indian philosophical institutions and thoughts. And its relevance, even in the present computerized world, lies in the little truth that it is practical, closer to life and is not abstract like the Upanishads. The teaching of Bhagavad Gita is Yoga. When the human soul becomes enlightened and united with the Divine, welfare and morality of the masses is assured.